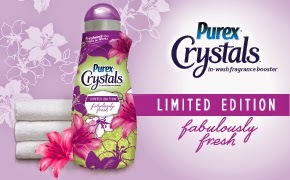 Have you tried Purex Crystals, yet? It's an in-wash fragrance booster to keep your laundry smelling fresh and clean. Right now, the current limited edition scent is Fabulously Fresh. I wish I could let you smell it as it is a whiff of spring. And with cold and rainy days like we've had at my house recently, I need a whiff of spring to keep me going. 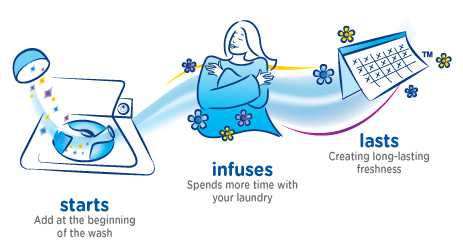 You put the crystals in with your laundry at the start of the wash (and yes, it's safe for HE machines, too). Then the scent is infused into the clothes and towels and gives you long lasting scent and freshness. I have to admit that the smell is a little strong for me because I don't like much if any scent on my clothes. I love using for my towels--especially the slightly older ones that don't smell as fresh as they used to. Same goes with swim towels. You know how they just start to smell a little 'funny' over time. Now I keep them smelling fresh--Fabulously Fresh. 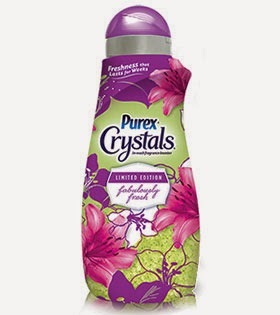 Keep watching my blog - there are going to be some Purex giveaways coming up in May. Disclosure: Purex provided me with a free sample to try in exchange for my review. All opinions are my own.